It was love at first sight. 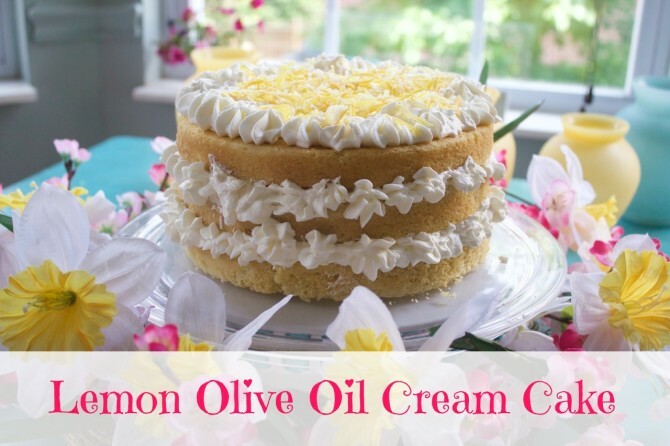 I saw this lemon olive oil cake in a magazine while at the nail salon. The pretty little cake was all I could think of. I envisioned tart, sweet, moist, happy, lemony and yet special because of the olive oil. It was all that and more. Captivated and frantic, because I couldn’t remember what magazine it was in. I had thought of slipping the magazine into my purse, but that’s not right is it? So I did the next best thing. I took a picture of the recipe. I only got the cake part, and I make up my own cream topping which ended up being better than the original recipe. I wanted the topping to be more than whipped cream. I wanted it to have some body. While mascarpone would probably be more of what I was looking for, cream cheese worked out just fine for the frosting. Not only does cream cheese stabilize the cream, it makes it richer, just the way I like it. 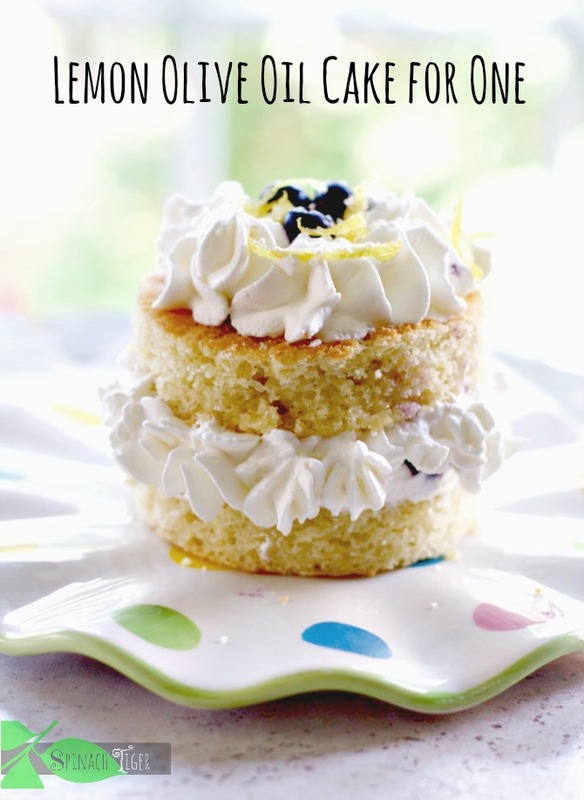 I made a snacking lemon olive oil cake here a few years ago that is just as good but so different. Not fancy and no cream. I like them both. 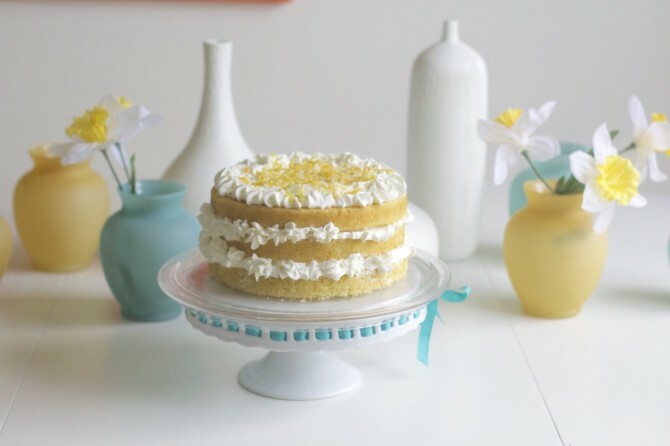 Like so many recipes that we fall in love with, I made this cake four times in ten days. I learned a lot along the way. Eventually I found the original recipe in Better Homes & Garden, but I ended up liking my version of the cream topping much better. I also changed around the technique in the recipe, after having some trouble with theirs. The recipe (even though it was in a magazine) was not perfect. Something made the cake sink a little in the middle. It didn’t happen every time I made it, and I’m still not sure why, but I changed the instructions a bit, which seemed to help. On one of the cake making days, I made a few individual cakes. Add blueberries if you have them. It makes the cake even better. To make a triple layer 9 inch cake, I doubled the recipe. You don’t have to get fancy like I did. In the original recipe, they layered the cream without using a pastry bag, and it was still so beautiful. The main thing about this cake is the taste. It’s moist, dense, and oh so lemony. I told you I made the cake four times. On one of those times I topped it with about 2 cups of sugared blueberries and took it to a Kentucky Derby Party. It was a huge hit! 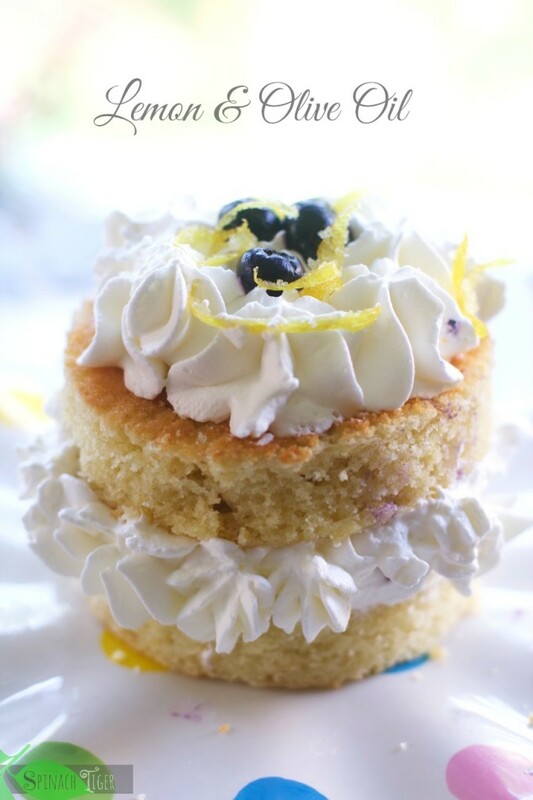 You can choose to serve the cake with a side of blueberry compote. It’s fabulous. On Another occasion I made it for Mother’s Day! I find this cake perfect for special occasions, and a great way to perk up the spirits of a very rainy season here. This tool will shred the lemon peel. Do that before you juice the lemon. The original recipe used meyer lemons for the candied lemon on top. I did not, as I like the tart lemons, as meyer lemons can be too perfumey. Stick with organic lemons if you can, because you will be eating the peel. 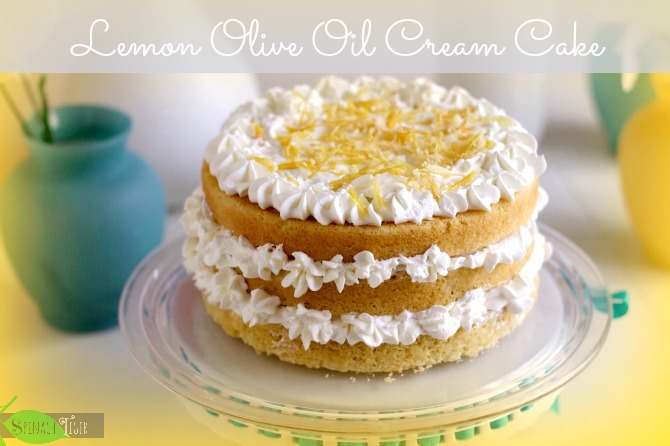 So tell me, what’s your favorite special occasion cake, and have you baked with olive oil before? Please connect with me on Instagram. I put all my food pictures there way before they hit the blog. Make the garnish first. Before juicing the lemons, cut the skin of the lemons to shreds. I use this tool. 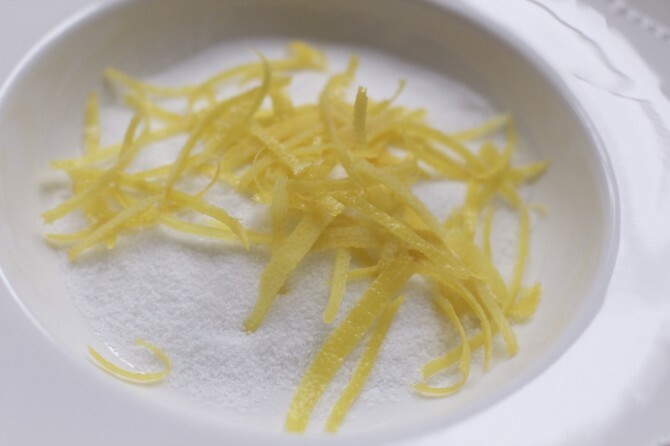 Put lemon peels into the sugar to dry from 1 to 4 hours.You may have to work some of the sugar off of the peel before garnishing. Grease and flour your cake pans. You can use three 6 inch pan for a triple layer cake or two 8 inch pans for a double cake. You can increase the recipe by 50% to make a triple 9 inch layer cake. Mix lemon zest into the sugar with your hands. Beat olive oil and sugar until smooth. Add in eggs one at a time for 20 seconds each. Beat for four minutes. Whisk together flour, salt, baking powder, baking soda. Set aside. Mix together buttermilk, lemon juice. Add dry and wet ingredients to egg mixture, taking turns until all is incorporated. Bake at 350 for 20-25 minutes or until toothpick comes out clean. Cool for ten minutes before removing. Cool completely before topping with cream. Beat cream cheese until very soft. Add confectioner's sugar. Add in lemon juice and cream and whip to soft peaks. Place one cake on cake dish. Spread top of cake with ½ cup of the cream. Place another cake layer on top. Spread with another ½ cup cream. Top with remaining cake layer. Spread with another i/2 cup cream. Spread ½ cup frosting on the sides of cake to make a light crumb coating. Spread any remaining frosting atop of cake. Top with sugared lemon peel. How much cream cheese? I don’t see it in the ingredients list. Thank you. This looks so lovely and refreshing. So many recipe pics on my phone. I really need to print some out. I hear you Margaret. Thank you. Haha. This is one good cake. Love this so much Angela. 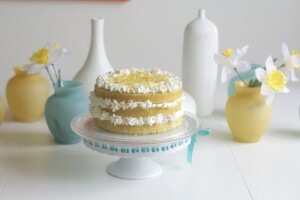 Lovely and love all the lemon flavor in the cream icing too!